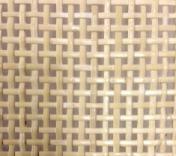 This page has pre-woven cane webbing for chair seats in 4 different patterns. Use cane webbing for chairs that have a groove around the perimeter of the chair, as shown at left. 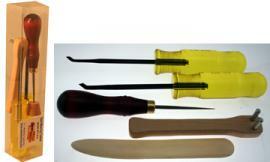 This is also called "sheet cane" and "pressed cane". 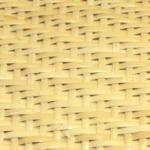 SCROLL DOWN THIS PAGE TO ORDER CANE WEBBING. Please read the running foot & cane size info. We want you to receive the correct size & quantity for your project. VERY IMPORTANT: Except for the 4 kit packs, all other cane webbing is priced by the running foot. 1 running foot of 24" cane webbing is 12" x 24". 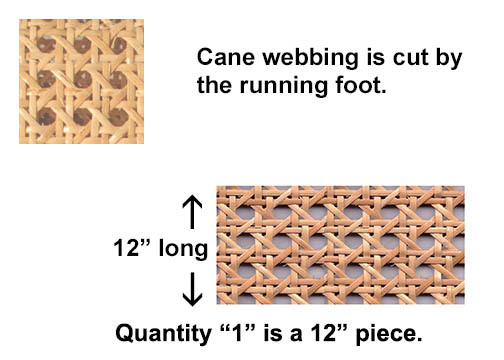 1 running foot of 18" cane webbing is 12" x 18". 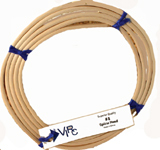 2 running feet of 18" cane webbing is 24" x 18. 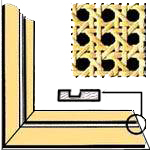 SIZE of cane webbing pattern is the measurement from the center of one hole in the pattern weave to the center of the next hole in the pattern weave. FREE INSTRUCTIONS will be included with your cane webbing order. 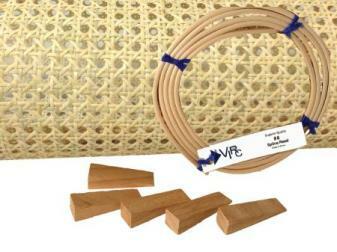 Cut pieces of cane webbing can NOT be returned. Please measure carefully. Allow extra width for the cane webbing that will go into the groove and extend out around the spline. This is usually 2" extra for each of the FOUR sides of your chair seat. If your seat is trapezoid shaped, be sure to measure from the widest part of the seat. 2" + widest part of seat + 2". Then 2" + from to back of chair seat + 2". Example: a 14" cane webbing seat requires : 2" + 14" + 2" across the width, 2" + 14" + 2" front to back. 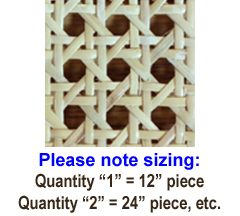 Size of cane webbing to Order: 18" x 18". IMPORTANT: Please choose the size of spline to match the width of chair seat GROOVE, across the TOP of the groove. There are 4 sizes of spline shown below. 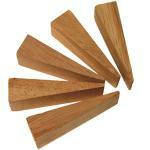 The spline is wedge-shaped to fit the groove with the cane in place. Example: #9 is cut to fit a groove that is 1/4" wide at the top and narrower at the bottom. Do NOT measure your old spline. NOTE: If you're the least bit uncertain about the size of the spline for your chair, we suggest that you also order an extra coil of a different size. One extra coil of spline is a lot cheaper than ordering more spline later and having to pay for the postal charges. Individual coils of spline are available at the bottom of this page.